Size 6 - $93.99 Size 7 - $93.99 Size 8 - $93.99 Size 9 - $93.99 Size 10 - $93.99 Only 9 left! You know the basic clown tricks. There's the one where they shake your hand, making a horn hidden under their glove honk loudly. Then there is the trick with the boutonniere. They draw your attention to the roses on your lapel, squeezing water onto your face as soon as the time is right. But you're not just any clown. You're something a little more special, a little bit atypical. Your tricks are ramped up. There's something else entirely under the flower pinned to your blouse. Something a little weirder. Something with a little grit. You know how to add macabre twists and turns to your summersault and cartwheel routine. We can't wait to see what you've got in your routine. 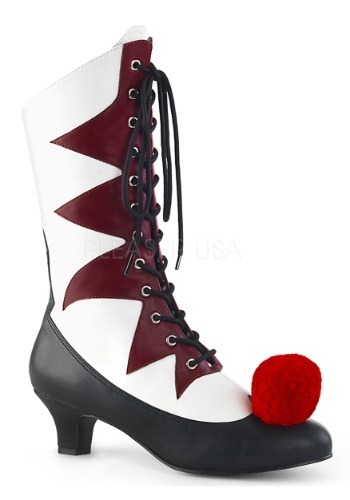 Just make sure your unforgettable uniform is complete with these evil clown shoes! These boots have an uptight Victorian style dress shoe style that's mixed with a diamond style jester pattern. The red pom on your toe ramps the style up a notch, making them stand out no matter what clown costume you're rocking. Are you ready to spread the fun? You've probably found the perfect jesting costume from our clown catalog. Now it's time to find your circus troupe. That's a big top we hope to avoid for life! Size 6 Footbed (heel to toe) 9" 9"
Size 7 Footbed (heel to toe) 9 1/4" 9"
Size 8 Footbed (heel to toe) 9 1/2" 10"
Size 9 Footbed (heel to toe) 9 3/4" 10"
Size 10 Footbed (heel to toe) 10" 10"